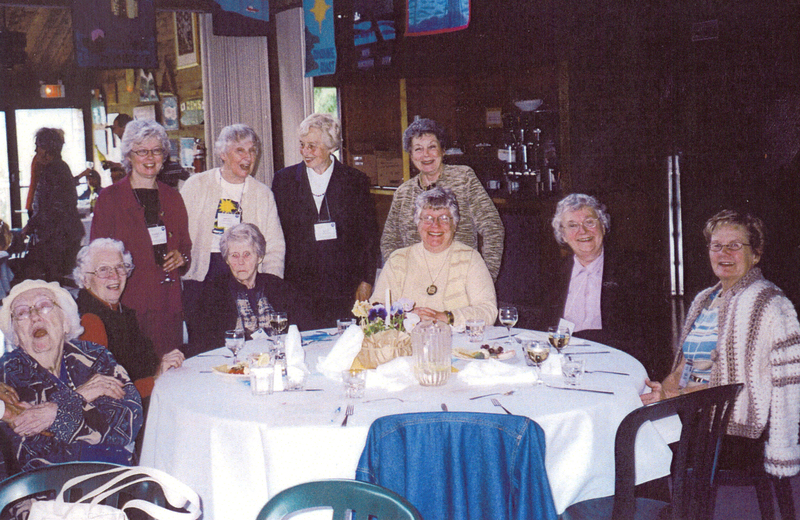 1986/87 Founding and Charter Members of CFUW Sunshine Coast Standing: Pamela Earle, Mary McKinnon, Mary Burgess, Shirley Huggins Seated: Mary Pellatt, Ninna Rublee, Mildred Cormack, Jo Fraser, Audrey Morton, Virginia Douglas The above picture was taken in April 2003 on the occasion of the British Columbia Conference of CFUW at Camp Elphinstone. The Sunshine Coast Club hosted the event. This December, the CFUW Sunshine Coast (CFUW-SC) will celebrate its 30th anniversary. Founding member Pamela Earle remembers the day it all began as clearly as if it were yesterday. "An ad was placed in the newspaper and three of us responded, showing up at a fourth person's home to consider forming a Canadian University Women-Sunshine Coast." She laughs: "I can't believe it was that long ago, and here we are: still fundraising for local women's education. We did that right from the start, you know, along with growing our club; we managed to raise a first bursary of $500, to a local woman attending SFU." Created by a handful of women in 1986, the CFUW-SC went on to build its membership (currently at 70), while faithfully raising funds for dozens of women hoping to attend post-secondary institutions. There is a lot to celebrate. With its focus on education, human rights, participation in public affairs locally, nationally and internationally, members' activities over the last thirty years have included everything from volunteering with the non-profit group, Salvaide in war-torn El Salvador, as well as protesting Columbia's drug cartels in Bogota, to hosting an array of political debates locally. Other members have addressed schools on "the rights and responsibilities of citizenship", volunteered on innumerable local initiatives, and promoted the arts. (Most recently, member Dorothy Fraser received the Award of Excellence for her contributions to Sunshine Coast organizations.) Other notables include author, Betty Keller and artist, Lynda Manson, a member whose artwork is on display in Paris currently. However, the " crowning achievement" of this group is the number of dollars (close to $150,000), given to Sunshine Coast women (175 of them ) seeking to better their education and/or training. This December's anniversary is one of two CFUW-SC celebrations. On March 8th, 2017 spearheaded by President, Unni Claridge and organized by Program Chair, Kathy Caswell, International Women's Day will be observed. In addition, Vice-President Melanie Lautt is exploring mentorship options, interest groups are meeting monthly on a variety of topics, and bursary fundraising continues. Pamela Earle, along with founding members Mildred Cormack, Marguerite Carriere, Montie Dowdie, Nora Neilson and Shirley Huggins are to be recognized for their creation of this significant group with its history of community engagement all those thirty years ago. New members are welcome the fourth Monday of each month; no university degree required. Additional information is available at www.cfuwsc.org.